to Sigma Chi, Xi Chapter! 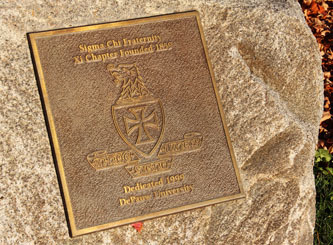 Proudly founded at DePauw University in 1859, the Xi is the second-longest-standing Sigma Chi chapter in the country. The Sigma Chi Fraternity is the preeminent leadership-development organization in the country, with the goal of cultivating and maintaining the high ideals of Friendship, Justice, and Learning. Sigma Chis at DePauw strive ever to live out the values of our founders on a day-to-day basis. Xi Sigs are proud to be incredibly involved on campus and in the Greencastle community. With members involved with honors programs, such as Management Fellows and Science Research Fellows, Interfraternity Council, peer mentors, campus tours, and media organizations, it's easy to find a Sigma Chi on campus, holding a leadership position. We also support DePauw's athletic programs, with brothers participating in several varsity sports including soccer, cross country, lacrosse, track and field, tennis, and golf. We also hold the importance of philanthropy in high regard, hosting three philanthropic events every year, including a joint house-building trip to New Orleans with Habitat for Humanity with Pi Beta Phi. Our Derby Days week continues to grow in supporters and donated dollars, with our fundraising benefitting the Huntsman Cancer Institute and Ronald McDonald House in Indianapolis. Please take a look around our website, read some of our brothers' original content, and connect with us on Facebook and Instagram. Two brothers win awards at Order of Omega, Monty won house director and we had four other brothers get an honorable mention! Over the past few years, the Office of Fraternity and Sorority Life has conducted surveys during each round of recruitment. The data, released this past April, shows larger trends in the fraternity recruitment process, but it's also helped the Xi Chapter to better plan for recruitment in the future. Members can view the full report and Sigma Chi-specific feedback after logging in above; if you haven't signed up yet, please click here to request a username and password.